It’s not too late to get your hands on a Henry’s House Teepee for Christmas. With limited stock still available, get your order in quick before they’re all gone. $55 : Oblong Feature Cushion Cover – 1 x Floral with Pink Stripe Panel and Pink Spot Circle with Red Heart. I had wonderful intentions to have my advent calendar up and ready for 1st December but somehow it has come to the 4th December and there is no sign of one, or the making of one, in my house. If I had a lot of time to spare I would make this cute little village. It is adorable! But since I have no time at all, I will need to keep it a little more simple. These ones are great for the time poor like me. I think we’ll make the mini envelope tree. Or should I do the paper bags in the basket? I think I’ll let the kids decide. But most importantly , what should we put inside? To pin these pics yourself, and for image credits, head over to the Henry’s House Christmas board on Pinterest. You’ll find a few more ideas there too. For my birthday I went with my husband and family to see the musical production Wicked. It was fantastic. I love musicals and this one was especially good. I LOVED it! But before we left I had wardrobe dilehma . My wardrobe, consisting of mostly black (to help hide all those lumps and bumps), was so drab 😦 My sister saw this lovely crochet flower necklace from twoandsix and suggested I make one. So that’s what I did. Of course it had to be green to match the wicked (or not so wicked 😉 ) witch, Elphaba. Without a pattern to follow and only the picture from twoandsix, there was a little bit of fiddling and undoing and redoing. This is how it turned out and I think it worked out quite well. I would definitely use better quality wool so that the stitches are more visible and not hidden in the fuzz of acrylic wool. And to stop the petals curling up, like the original flower from twoandsix, I think I should have used a looser stitch. I always do things tightly. I must get better at that! This is the first time I’ve written a pattern so hopefully it makes sense. Please give it a go and let me know if it works out. Remember, the stitches are Australian so you may need to convert them to US if that is what you are used to. It’s getting closer and closer to Christmas and I can’t believe the Christmas count down has started already. Is it only 41 days until Christmas? For those of you who like to be prepared and get your presents organised early, you can take advantage of our new promotion. When you and a friend order a Teepee, you will both receive free cushion covers to the value of $80. Teepees are fantastic to play in and kids can have so much fun, but sometimes it’s just nice to relax. By adding cushions you create a quite place for the kids to just chill. Or place a couple on the bed or on a chair to make any place comfy, and super cute. * Offer valid until 20th November 2013. When you place an order for a Teepee, add a note with your friends name and list the cushion covers you would like free. When your order and your friend’s order come through you will both be eligible for your free cushion covers. 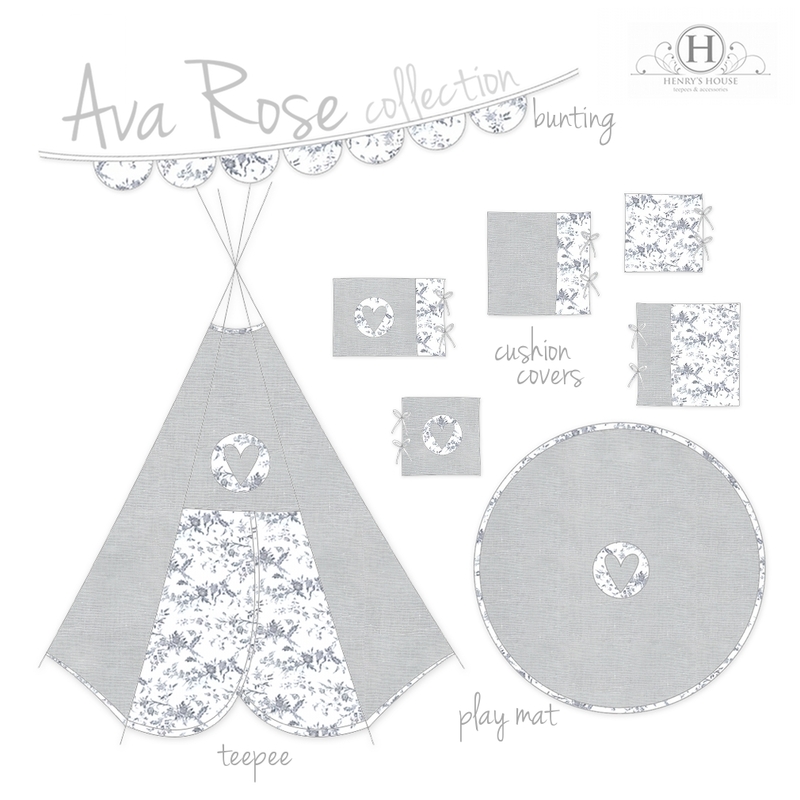 I’m really enjoying this new Teepee collection, Ava Rose. It is just so pretty. Do you think this will make it easier to choose your colours? Leave a comment below letting us know why you want to win this Taylor Teepee and matching bunting. Please leave only one comment to make this fair for everyone. The competition will close at 9pm (QLD time) on Saturday 1st December 2012. The winner will be chosen randomly soon after, and notified by email. This prize does not include delivery costs. Delivery starts at $40 and will need to be paid by the winner before the prize can be sent. The winner will have 24 hours to contact Henry’s House to arrange payment. If this does not occur another comment will be chosen randomly to determine a new winner. Celebrate one year of Henry’s House.